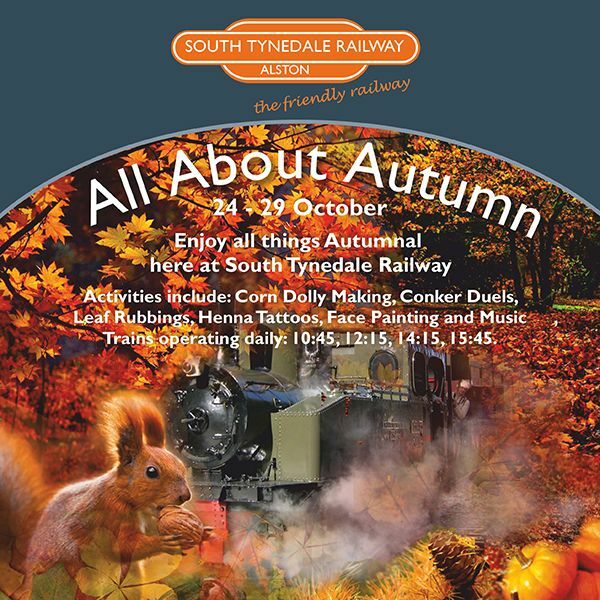 The leaves are changing colour, and the nights are drawing in but we’re determined, before winter arrives, to have one last week of autumnal fun here at South Tynedale Railway. After that we close until we start our Santa’s Toyland Railway events in December, so we don’t have much time left! Our ‘All About Autumn’ week during half term (24th – 29th October) will be full of seasonal fun and activities for kids of all ages, with trains running every day until 30th October, culminating in our Halloween Spooktacular. Join us in our Activity Hub during the week for traditional games such as conker-duelling, corn dolly making, and leaf rubbings; or why not indulge in a henna tattoo, or a spot of face painting? We’ll have a treasure hunt around the station to keep you on your toes, and as we love quizzes, we’ve planned a special Autumn Quiz to ensure that every brain cell is kept busy while you’re visiting us. Our Halloween Spooktacular on 30th October will make a fabulously scary finale to our main operational season. Visit our witch’s cave and see if you can identify the mysterious body parts! Pick your wound or disease and have the Carlisle College students make you up with their theatrical make-up. And show off your best fancy dress costume (we’ll be wearing ours).